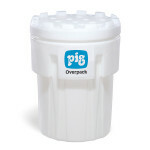 PIG® Overpack Drums are ideal for shipping damaged drums and containers. These drums come in a variety of sizes with notched lids that are easy to open and close. The overpacks are durable, light-weight and chemical-resistant and seal tightly for strength and security.